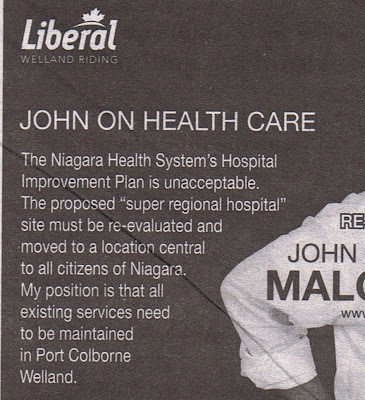 Welland Liberal federal incumbent MP John Maloney ran the above ad in Niagara This Week, Sept.19, 2008. Is this guy running in a provincial election?! The Niagara Health System and its HIP are a provincial responsibility - and during the last election, Dalton McGuinty and his Niagara MPP's, Kim Craitor and Jim Bradley, pretended there were no problems whatsoever with Ontario's government-run health monopoly. Since the Ontario Liberals took office in 2003, has Maloney ever contacted McGuinty, Bradley, Craitor, former health minister George Smitherman, or current health minister David Caplan on the issue of the Niagara Health System's governance and funding model? If so, what was their answer?? And if not, why not? Was this not of any concern to Maloney - for the last five years - until just now?! Has Liberal MP Maloney bothered to send any letters to St. Catharines Liberal MPP Jim Bradley asking Bradley to call for an immediate investigation into the NHS's mortality-rate, revealed in Nov. 2007 as being the third-highest in Canada? No Liberal has yet explained the reasons for this. Jim Bradley has refused to answer questions or publicly explain why this occurred in the hospital in his own riding. Has Maloney ever sent any letters to any Liberal provincial MPP raising his concerns about the NHS? McGuinty's Liberals are responsible for running Ontario's health care monopoly - these are their policies, their facilities, and their LHINS coming up with the ideas which Maloney finds are "unacceptable": so then, has Maloney contacted them? Did any provincial Liberal answer? What was their reply? Does federal Liberal Maloney now want to stall the provincial Liberals proposed new hospital even further? What will the impact of that delay be, in terms of money and patient detriment? Will John Maloney be answering that question, or will Jim Bradley be hiding from answering that question? And in any event, does Maloney think that simply moving the new hospital to a central location will magically solve the systemic problems brought about by institutionalized monopoly health care? When Liberal Stephane Dion recently showed up right in Niagara, for his St. Catharines town hall green shaft announcement, he never once even mentioned the words 'health care'. Of course, both Jim Bradley and John Maloney know that - they were there. (click photo to enlarge) Dion's Liberals cooked up a dog's breakfast of dodgy, shifty, shell-game social policies, painted their pig with green lipstick, and have essentially created a new GST - the Green Shaft Tax. Dion blatantly lies when he says "the global scientific community is agreed that climate change is caused by human activity"! But that is not true!! What a load of rubbish this Liberal mail out is; what a hypocritical waste of resources! Has Bumbledore Dion bothered to calculate the ecological footprint associated with his own propaganda?! How can anyone take this Liberal clown and his sad bag of tricks seriously? In his lust for political power, Dion tries to intimidate and frighten with horror scenarios of droughts, floods and pestilence of every conceivable kind - this, as he pollutes his way across Canada in his aging, pollution-spewing jet - which Grits laughably defend, citing that they pay for their sins by buying "carbon offsets"! Come on! What a joke. Everything these Liberals do needs a corresponding "offset" - OF REALITY. (Below) I recall the first time I saw the World Trade Center towers was from the window of a train in New Jersey headed for New York City in the early 70's. I can still remember the thrill of that first glimpse of the massive north tower under construction, almost fully clad in its aluminum skin, gleaming miles away against a clear blue sky, while the south tower was swiftly rising alongside. These are the first and only good memories I have of the twin towers, for I never had the chance to see them as they were again. 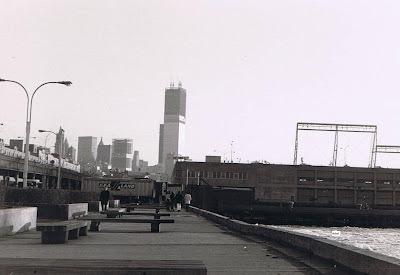 This photo was taken by R. Bobak looking south from the docks by the icy Hudson near Leroy St. and the old West Side elevated highway seen at the left, around the winter of 1970-71. * * * * some thirty years later . . .
(Above) Two photos of the New York City skyline as it looked on Mon. 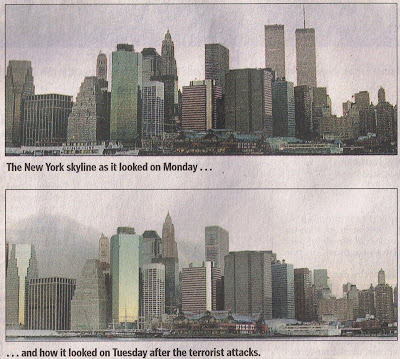 Sept.10, 2001, and then on Tues. Sept. 11, 2001, after the World Trade Center was attacked and destroyed. Don't agree with Dion's Green Shaft? You too, might be Hitler! In Stephane "Bumbledore" Dion's Priority Poop-O-Gram is a photo of a Liberal Poop-O-Gram which Liberal MP Ken Dryden, from Toronto, sent in Apr. 2008 to households in St. Catharines. Seeing that Pachauri is good enough to be quoted by the Liberals when it comes to smug lectures about climate change in Canada, why isn’t Dryden explaining why Pachauri sings a completely different tune in India? “India loves the UN’s climate change policies and so does India’s representative at the UN’s Intergovernmental Panel on Climate Change, Rajendra Pachauri. Why the love-in? The Indian government’s new “National Action Plan on Climate Change,” which Pachauri helped craft, plainly explains why: The UN formally establishes that global warming is a matter of secondary importance to India, allowing the world’s largest democracy to pursue its own best interests. And India doesn’t. Throughout its National Action Plan, India demonstrates that it will divert precious little of its scarce resources to solving the climate crisis. Where greenhouse gases will be curbed — for example, by aggressively building hydro dams or modernizing industry — the curbs will be a by-product of India’s national security concerns or economic development plans. “No firm link between the changes described below and warming due to anthropogenic climate change has yet been established,” the report states matter-of-factly, before proceeding to list the areas in which the science is not settled. The prescription? Grow the economy as fast as one billion people can possibly manage by building hundreds of new coal-fired power plants — India is planning a five-fold increase by 2030, making it the world’s third largest CO2 producer. How did Pachauri react when his own prime minister, and the government that he represents at the UN, not only downplayed man-made global warming but positively asserted that there is no proof for it? 'Get off our backs', says Pachauri: this is the spokesman Liberals use to fearmonger Canadians on climate change - while his own country has carte-blanche to construct hundreds of new coal-fired coal plants?! Who wouldn’t be skeptical when Liberals such as MP Ken Dryden use hypocrites like this, as their spokesperson/role-model to somehow legitimize their shifty Grit tax schemes? Will the Liberals also be using Pachauri's line to defend their re-shifted Green Shaft against criticism? Will Bumbledore Dion's Liberals, to accuse those who don’t subscribe to the Liberal's end-of-the-world, man-made climate-doom scenarios, eventually play the 'you’re Hitler' card as well?! ...and isn't it funny how in 2015, these same Liberal GreenFear-mongering GreenShafters had nothing to say about the disaster that was Rajendra Pachauri?! "Few countries have a bigger stake in global climate change talks than the Philippines, which is hosting this week’s Asia Pacific Economic Co-operation summit. This nation of more than 7,000 islands deals regularly with deadly floods and is still reeling from last month’s Typhoon Koppu, which left 58 dead. The nation is among the most vulnerable to climate change and is leading a push to have the Nov. 30 Paris conference set a goal of keeping the rise in global temperatures to below 1.5 degrees Celsius. Countries committed in 2010 to a target of 2 degrees Celsius. World leaders are using the setting of this year’s APEC summit to build momentum for an aggressive deal in Paris. Yet Canada’s Foreign Affairs Minister Stephane Dion says the Paris conference isn’t likely to deliver the breakthrough required. “If you compare with what the science is asking us to do, it’s very unlikely that Paris will deliver a two-degree-Celsius agreement,” he said, pointing to a recent United Nations report showing that actions announced to date will only keep the rise in temperatures to 2.7 degrees. “But if we have no agreement we may go to three or four [degrees]. So 2.7 is not what the science is asking us to do. It’s fair to say that we need to do much more,” he said. In the lead up to the summit, Mr. Dion said Canada will be working with France, the United States and other nations to push for a five-year review in the hope of getting better results next time. Mr. Dion discussed the idea Tuesday in Manila with his Chinese counterpart, foreign minister Wang Yi. It's fair to say that Bill Curry didn't analyze Kyodiot Stephane Dion's record of GeenFear mongering, nor did he provide any counter balance to Dion's cherry-picked 'man-is-to-blame' greenshevik climatalarmism. Canadian tax payers are most vulnerable to AGW-pushing climate-change hoaxters under Liberal leadership, abetted by a stenographic, Lib-friendly, ask-no-questions press.